The largest passengership ever constructed visited Rotterdam during one of her first cruises from Southampton, England, at the 24th of may 2016. The city was very crowded, all quays lined with people and a huge trafficjam brought everthing around the port to a standstill. Because the terminal is located in the middle of the city center, an event like this always has massive attention. There were times that building the prestigious largest passengership of the world was a competition between several companies. The names of the companies competing were Cunard, HAPAG, Norddeutscher Lloyd and Compagnie Generale Transatlantique. When the time of the oceanliner ended, also this competition ended as there was the thought that the ideal size of a cruiseliner was around 20.000 to 25.000 tons. The large liners were simply not economical to operate and as the new cruiselines had to create their own finances instead of them relying on state subsidies, ships had to be economicly viable. But then cuising boomed from the middle of the 1980's onwards. At that time, the largest cruiseliner in the world was, how could it be different, the 70.000-ton former liner France of the CGT, in the 1980's sailing under the name of Norway for Norwegian Cruise Line. The ship dated from 1960 and it was thought that there would never be built another cruiseliner of this size. But then, Royal Caribbean started to mingle in the battle. In 1987, the company that had been founded in the late 1960's so several years after the France had entered service, launched a ship of 73.000 tons, that became the largest cruiseliner ever built and the largest existing passengership in the world. She of course was Sovereign Of The Seas. The first ship with the now familiar 'Of The Seas'-ending. Different from ever before, two more equal ships were also built, Majesty Of The Seas and Monarch Of The Seas, both introduced in 1991. At that time, Royal Caribbean was not the large company that it is now. But they started a new battle for the largest after these ships were introduced. Around the same time, Norway was enlarged to 76.000 tons and again gained the title of worlds largest, untill in 1995 P&O Princess Cruises introduced the Sun Princess and her three sisters of 77.500 tons. One year later, Carnival Cruise Line introduced the Carnival Destiny, the first cruiseship to pass the 100.000-ton mark. As the largest cruisecompany in the world, they were kinda forced to enter the battle, but it was their only attempt in doing so. In 1998, P&O Princess pushed up the scale with Grand Princess of 109.000 tons but then Royal Caribbean came back again and this time they took a very large leap forwards. In 1999, Voyager Of The Seas became the largest measuring 137.000 tons and then the good old Cunard Line introduced the Queen Mary 2 of 148.500 tons in 2003. Passengerliners had never been this big and besides that, they were built in series of three, four or even more. But in fact in was the same battle as in the 1930's, with several companies trying to built the biggest. But after 2003, there has been only one company competing for the largest passengership in the world, Royal Caribbean International. The 154.000-ton Freedom Of The Seas entered service in 2006, followed by two sisterships. 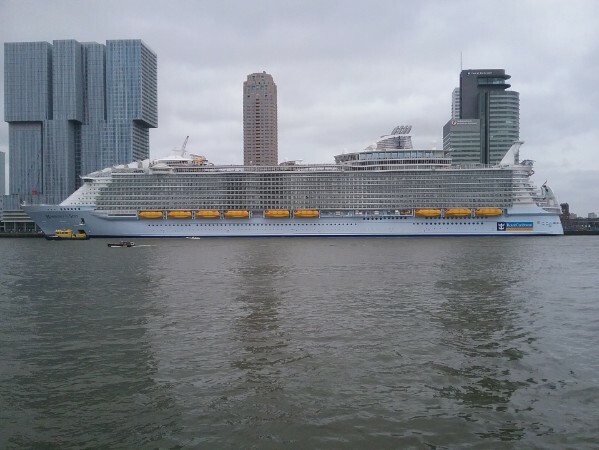 And then, the company also introduced a ship that we then thought would never be topped again, the monstrous 225.282-ton Oasis Of The Seas, entering service in 2009 and of couse a sistership, Allure Of The Seas, followed. In december of 2012, RCI ordered a thirth ship in the class, but slightly re-designed and also, larger. Because of the changes in this new ship when compared to the original two ships, the company itself claims that it could be easily seen as a totally new class instead of a thirth Oasis-class. Her name: Harmony Of The Seas. So although Harmony Of The Seas is officially the thirth member of the Oasis-class, the ship is very different. She is in fact a combination of the size and innovation of Oasis Of The Seas, mixed with the technology and innovations from the Quantum-class of ships. During the same time, RCI introduced this class, of which the thirth member Ovation Of The Seas of 2016 is also featured at castlesoftheseas.nl. The first steelcutting for the Harmony Of The Seas was performed at the STX France yards at St.-Nazaire, France at the 23rd of may 2013 although her earlier sisters were built at the STX Europe yards in Turku, Finland. The yardnumber under which this 'Oasis3' was going to be built was A32. This yardnumbering is a tradition dating back to the earliest years of the wharf, where passengerships are always built in the numbers 31 or 32. At the 19th of june of 2015, the ship was floated out of her buildingdock and finally completed at the 12th of may of 2016. Her satisfactory seatrials had begun at the 10th of march of 2016 and her deliveryscedule was met as sceduled. Some 70.000 people watched the ship finally leave the wharf at the 15th of may, when she set sail from the wharf towards Southampton, her first port of call. 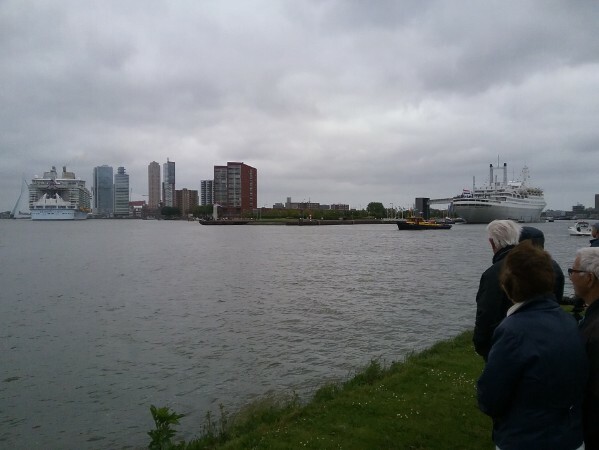 All day, crowds filled the quays of Rotterdam city harbour to awe at the ship. In my opjective, attention was even larger then when Queen Mary 2 visited in 2004 for the first time, or when Oasis Of The Seas came in for a visit in 2014. What makes Harmony Of The Seas different from the Oasis Of The Seas and Allure Of The Seas is first of all her size. To fit in the combined innovations from the Quantum- and the Oasis-classes, with of course the exception for the North Star that is kept only for the Quantum-class, the ship is 2,15 meters longer making a total lenght of 362,12 meters. Of course, this makes the the longest passengership ever. She has a width of 66 meters on her widest point and 47,42 meters at the waterline. This makes the ship 6 meters wider then her sisters, of course creating the widest passengership ever built. Her draught is 9,30 meters, not the deepest ever because it is her flat, wide hull that creates the stability of the vessel, also making it possible to visit more ports. This all is 226.963 tons, some 2000 ton above the measurement of her sisters. There are 18 decks in total of which 16 are accessible for the passengers. About them, the total capacity of passengers is 6410, based on lower berths the number is 5479. Also, of course crew has to be there and those number 2100, that is almost three times the passengernumber caried on the first trio of ships for the line in the early 1970's. That fact alone shows the immense growth of cruiseliners over the last decades, as the ship is some 13 times larger then the 1969-built Song Of Norway. Of course, RCI is paying some money for the ship, in total the buildingcosts have been $1,35 billion. Yes, of course making her the most expensive passengerliner in history. Remember with that, that the company is now also building a fourth ship in the class. Three 20,5 MW ABB-designed Azipod thrusters propell the ship, helped by four 5,5 MW bowthrusters. Nice to name, those bowthrusters have more power then 7 Formula-1 Ferrari's combined. She can sail at 22,6 knots and is powered by six Wärtsilä designed diesel-electric engines. Yes, now thát is a high slide you won't find on your regular childrens playground. As said, the ship is lenghtend and widened in contradiction to her sisters so she can fit in all innovations for people who do not want to choose between the Oasis- and Quantum-class. The most talked about Harmony Of The Seas exclusive is of course the Ultimate Abyss, a double slide (normal slide, not a waterslide) dangling from her backside where riders drop a staggering 10 decks from a height of 45,72 meters above the waterline at a speed of 9 miles an hour. People who are a little less adventurous do have other options though. The combined number of pools, waterslides and flowriders is 23 and they contain more water (2150 tons) then the geiser Old Faithfull spits out during 94 eruptions. Those other options for watery fun includes the sisterhood of three slides named Perfect Storm or the Splashaway Bay and H2O Zone waterpark and several whirlpools. Other watery entertainment can be witnessed at the Aqua Theater at the back of the ship, where acrobatics are performed from two 10-meter-high divingplatforms into a pool of 5,4 meters deep, that is, together with the Aqua Theater pools at her sisters, the deepest pool at any cruiseliner. Aboard there are 20 diningvenues, including 8 speciality restaurants. A highlight in those diningoptions is the two-deck high Wonderland restaurant in a fairytale decor. Cocktails can be ordered in a lot of places, but the gimmick Bionic Bar is also there, stolen from the Quantum-class. Here, you can order via tablets from two robotic arms that can create the perfect cocktails. Of course there is also Central Park, like the park aboard her earlier sisters, having 10.587 plants, 48 vine plants and 52 trees from 10 different species, some of which are taller then 6 meters. Art-lovers can also have a great cruise, as RCI sais that Harmony Of The Seas has more works of art aboard, totalling 11.252 pieces, then there are paintings displayed at the Louvre in Paris. Other ways to entertain yourself are the Casino Royale, the 3D Movie Theater, Puzzle Break (which is a live room-escape game for 12 players at the same time), the Sudio B icerink, a 1400-seat Royal Theater for Broadway productions (starting with the award-winning Grease) and the DreamWorks Experience where characters from DreamWorks entertain the smaller passenger. For sports and adventure, next to the earlier named Ultimate Abyss, the ship has the zipline, two rock-climbing walls and a full-size basketball court. The ship has 2747 staterooms in the staggering amount of 43 categories, of which several insides are so-called 'virtual balcony cabins'. This was an introduction at the Quantum-class of ships and it means that those cabins, although inside, offer an outside view through nearly floor to ceiligh high 80-inch LED screens that are showing live-images from the ships outside camera's. To name all entertainment facilities in detail would be as monstrous as the ship itself, so I try to just name the highpoints and innovations and this already is a very long list. Passengerships have become total entertinmentcomplexes to give everybody a very thrilling and exciting experience and this is of course immensly attractive. It has to be, as the passengernumber of almost 6500 has to be met to justify and earn back the costs for the vessel. A ship like this also excites me, but somehow I think that it also is loosing some of the feeling and romance of cruising. To find yourself at sea, take a break from all fuzz and hectics from shore and really have the feeling that you are away from 'it all'. Ships like Harmony Of The Seas bring 'it all' back aboard and in my opinion, this spoils the idea of getting away to sea. To be a little philosophical, I am curious or everybody sailing these ships will have glanced over the railing once to the wideness around them, the ocean. And that has to be, again in my opinion, the reason to book a cruise instead of a land-based resort. I think cruiselines do not always have to follow all possibilities that they can create, but have to offer that what is the pluspoint for a vacation at sea. Otherwise, when land-based resorts and cruiseships become too much alike, they will loose that extra and this can, over time, destroy the industry as being an alternative. But of course, it is for everybody to decide for themselves. Her deliveryceremony took place at the 12th of may 2016 and, as she is the largest moving man-made object ever it of course was not just a handshake that did the trick. The ceremony at St.-Nazaire was held in the Aqua Theater and of course was attended by Richard Fain ((CEO and Chairman of Royal caribbean Cruises), Michael Bayley ((President and CEO of RCI) and Laurent Castaing (General Manager STX France). The ceremony was truly dedicated to the crew of the ship, as well as the people that had been part of the whole project. 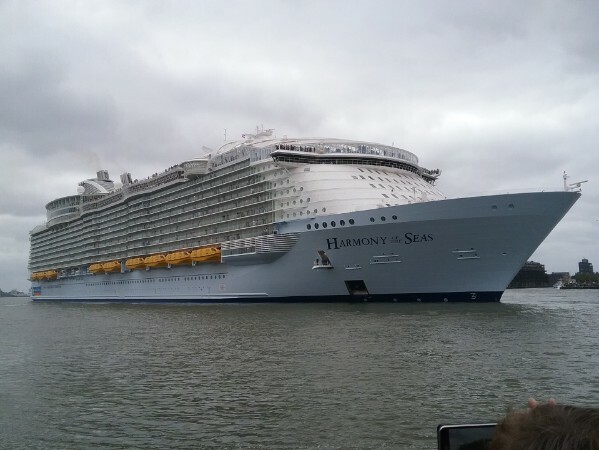 Below, Harmony Of The Seas shows off her huge, 66 meter wide face. It is the same width of two ships of the Sun-class of Princess Cruises combined, who were the largest cruiseships ever in the mid 1990's. After the ship arrived at Southampton at the 17th of may, from where she undertook a short 2-day invitation-only cruise before her first cruise with paying passengers started at the 22nd of may, taking her to Rotterdam. After arrival back at Southampton, she sailed for her first longer cruise towards Barcelona, departing at the 26th of may and arriving at the 7th of june. In an ironic twist of fate, Harmony Of The Seas left Southampton for her first port on that cruise, Cherbourg. Some eighty years earlier to almost exact the same date, the once largest passengership in the world, Queen Mary, also had departed Southampton for Cherbourg. She departed at the 26th of may 1936 for her first transatlantic crossing.